We’d love your help. Let us know what’s wrong with this preview of Every Last Lie by Mary Kubica. To ask other readers questions about Every Last Lie, please sign up. Jillian There are quite a few questions she author never answered by the end of the book. Annoying! Mary Cielock i agree. it was awful. Of course I gave this 5 stars; what did you expect? 😂 In all honesty I’m a Kubica junkie. I truly love how fleshed out her characters are and how the suspense just builds from beginning to end. This one was very different than her previous three novels. Maybe it was because Clara was in a similar walk of life as I am (young mother with 2 small kids) or maybe it was because she put some of my worst fears on paper, but I really connected with the story. I think readers will be split over the endin Of course I gave this 5 stars; what did you expect? 😂 In all honesty I’m a Kubica junkie. I truly love how fleshed out her characters are and how the suspense just builds from beginning to end. This one was very different than her previous three novels. Maybe it was because Clara was in a similar walk of life as I am (young mother with 2 small kids) or maybe it was because she put some of my worst fears on paper, but I really connected with the story. I think readers will be split over the ending; personally I loved it but I can see how some might be expecting a different direction. This ended up being a buddy read with the lovely Sam @ Clues and Reviews (she loved it to by the way) and trust me, you’re going to want to have someone to talk to once you finish it. My mood has been solely focused on slow burning novels at the moment; I’m not sure what the reason is behind this. Maybe it’s a need for a deeper connection with my characters, possibly it’s because I have had so many review copies to churn out that my inner book nerd is craving something I don’t feel pressured to fly through; whatever the reason, THIS book satisfied that desire. Please be aware that there is nothing fast paced about this novel; it needs to be savored and enjoyed slowly as it is heavily character driven. I’m amazed that a book can lack so much action and yet captivate my attention so fully. Even with it being a slow paced read, I still found myself not wanting to put it down, only wishing I had more time to read continuously. So this is your warning for those who like to constantly state that slow books=boring books; this psychological suspense won’t be for you. THAT ENDING. I’m sure it was just me, but I was completely taken by surprise with that ending. Maybe it’s that I’ve read so many twisty novels of suspense lately that keep trying to out-do each other with elaborate, over-the-top schemes that this finale was refreshing and powerful to my psyche. I won’t say more to avoid spoilers or causing your mind to drift in any one direction, but I’m convinced it’s the type of ending that will be controversial amongst readers; you’ll either love it or you’ll hate it. I can’t get into WHY I loved it, but just know that I did. It was a risky move of Kubica and I applaud her for going outside the genre’s comfort zone to give us something fresh. Note- outside of genre’s comfort zone is not referring to a supernatural/paranormal twist. Highly recommended to suspense readers looking for a realistic, moving suspense that deals with the domestic struggles of one young family; if this is you then look no further. This was another enjoyable read by one of my favourite authors, Mary Kubica! EVERY LAST LIE by MARY KUBICA is an interesting, thrilling, suspenseful, and cleverly written novel that has a really engaging storyline and solid characters that grabbed my attention from the very first chapter. MARY KUBICA delivers an impressive read here told in the alternating perspectives of Clara’s investigation into the death of her husband, Nick and in Nick’s voice of his last months leading up to his accident. T This was another enjoyable read by one of my favourite authors, Mary Kubica! MARY KUBICA delivers an impressive read here told in the alternating perspectives of Clara’s investigation into the death of her husband, Nick and in Nick’s voice of his last months leading up to his accident. The only thing that I found a little distracting was that there were no chapters separating Clara’s and Nick’s stories. They just ran into each other and I found that I had to go back and re-read to see if I was reading Clara’s perspective or Nick’s. Once I realized that there were no tell-tale signs to differentiate the two then I found it a little easier to follow along with the storyline and all the characters involved. (I am sure this was just a NetGalley formatting issue though and won't be like this on the actual print copy when released.) Update: Netgalley sent me an updated version of this book with Clara & Nick's perspectives clearing marked. I found it a really interesting read that explores how when are minds are so tormented with grief it can really mess with our psyche and how we ultimately perceive things as being the truth or fiction. I could really relate to how Clara reacted to her overwhelming grief as she presented with quite a few things that I know that I would and could have done. Can’t sleep, can’t eat, can’t think straight, can’t function normally, overactive imagination, and obsessive behaviour to name a few. To sum it all up it was an entertaining, fast-paced, and an easy read with an unexpected but satisfying ending. Highly recommend!! Thank you so much to NetGalley, Mary Kubica, and Harlequin (US & Canada) / Park Row Books for the opportunity to read an advance copy of this book for a fair and honest review. This is the latest dark and disturbing psychological thriller from Mary Kubica. It explores the state of a marriage and asks whether it is really possible to know your partner. The story is narrated through the perspectives of Clara Solberg and her husband, Nick. A shattered Clara has recently given birth to son, Felix, and is looking after him when the police knock on the door. Nick has been killed after he crashed into a tree on his return journey from collecting 4 year old daughter, Maisie, f This is the latest dark and disturbing psychological thriller from Mary Kubica. It explores the state of a marriage and asks whether it is really possible to know your partner. The story is narrated through the perspectives of Clara Solberg and her husband, Nick. A shattered Clara has recently given birth to son, Felix, and is looking after him when the police knock on the door. Nick has been killed after he crashed into a tree on his return journey from collecting 4 year old daughter, Maisie, from ballet class. The police have ruled it an accident. An overwhelmed Clara is suffering from shock, grief and finding it hard to come to terms with her new status of widow and single mother of two young children. Her father is struggling to cope with caring for her mother, who is caught in the grips of dementia. Her suspicions arise when Maisie begins to suffer from terrible nightmares where she talks of a bad man and a black car. The police dismiss her concerns of there being more to Nick's death. However, an obsessed Clara cannot let it go as she starts investigating in her search for the truth and whether Nick was murdered. In this twisted story, it soon becomes clear that Nick's life harboured secrets and lies. The novel starts with a slow pace but later shifts dramatically as the story becomes considerably more fast paced. There is plenty of suspense, tension and twists. It is beautifully written and well plotted. I really liked the characters of Clara and Nick, a man of good intentions and coming clean but never quite gets there. An enjoyable and entertaining read. Thanks to Harlequin for an ARC. A *complete* miss for me. I figured out several key twists long before they were revealed, and I pretty much hated Clara. Complete review to come. Every Last Lie is a book that seems to be suffering from a bit of an identity crisis. On the one hand, the books hints at dark secrets, but on the other, it doesn't want those secrets to be *too* dark, lest the characters become unlikable. It probably goes without saying is that the end result is the book falls flat, and at times it even de A *complete* miss for me. I figured out several key twists long before they were revealed, and I pretty much hated Clara. Complete review to come. Every Last Lie is a book that seems to be suffering from a bit of an identity crisis. On the one hand, the books hints at dark secrets, but on the other, it doesn't want those secrets to be *too* dark, lest the characters become unlikable. It probably goes without saying is that the end result is the book falls flat, and at times it even delves into ridiculous territory. There will be a fair amount of spoilers in this review, so read at your own risk. I'll say right off that my biggest issue with this book is the characters, particularly Clara and Nick. I couldn't stand either of them, which isn't the determining factor in whether I like a book, but I could almost sense the author straining for me to like them. As a couple, they're nauseating. Every time Nick waxed poetic about his wife it came across as cheesy rather than endearing. And Clara has such a huge blind spot when it comes to her husband that it's a wonder she can see anything at all. On their own, they're no better. Let's start with Clara. The book wants me to sympathize with her as a grieving widow, and while that coupled with the possibility of her having some form of postpartum depression or postpartum psychosis did allow the book to stretch its credibility, it's way too over the top in the end. I could understand Clara latching on to the idea of Nick's death not being an accident, particularly given Maisie's actions. However, Clara becomes unhinged, in a way that would have worked if this book wanted to go all the way to the dark side. This book doesn't want to go there, though, and so even though Clara repeatedly neglects her children to the point of abuse, acts out in ways that should have made the people around her feel a lot more alarmed for her state of mind, and eventually resorts to violence, I felt I was supposed to sympathize with her. The worst, most egregious example of this is when she loses all control with Izzy, her mother's caretaker. *Of course* Izzy turns out to be a thief, because otherwise the reader might be appalled by the fact that Clara brutally beats her. I also found it just ludicrous that Clara gets self-righteous about what her children shouldn't be exposed to, but ultimately stops beating Izzy only because Maisie sees her doing it. Oh, I'm sure *that* won't cause the poor kid any lasting trauma. I also rolled my eyes so hard at the detective who doesn't even do so much as call social services when an unwashed, unhinged new mother covered in blood (blood she outright says isn't her own) shows up at the police station with her two kids in tow--even though he suspects she assaulted Izzy. How does this woman not end up arrested? Nick isn't much better. Clara's father issued all kinds of warnings about him, and it turns out he was right. There are varying degrees to Nick's sins, but since there's a whole laundry list of them, I ended up outright hating his character. There are his sins of omission, which range from mild (not telling his wife about an ex-girlfriend making a reappearance in his life) to outrageously awful (not telling his wife about said ex's suspicions about her son's parentage, not telling his wife about the malpractice suit being brought against him, not telling his wife about losing their entire savings, not telling his wife about... Yeah, seriously. I haven't even listed all the things he neglects to tell his wife about.) Clara's dad is straight up right about Nick being bad news, there's no doubt about that. The worst part is, after all the terrible things he does, the author pretty much gives him an out by making him win big after betting on a sporting event (because, ya know, what spouse *doesn't* want their spouse exposing them to potential further financial disaster by engaging in sports betting), thus recovering the entire savings he lost. Yep. I'm not making that up, sadly. Having really enjoyed Mary Kubica's THE GOOD GIRL I was really looking forward to reading EVERY LAST LIE. "They say that death comes in threes"
Baby Felix is four days old when Clara Solberg talks to her husband Nick for the last time. He phones her as he's on his way home with their four-year-old daughter, Maisie. "Chinese or Mexican? he asks, and I say Chinese". Those are the last words exchanged between the husband and wife. When Clara hears a car coming down the road a short while later, she waits for the sound of the garage door opening. Instead she hears a knock on the door. She opens the door to see a strange man on her doorstep. He's there to say the words no one ever wants to hear. Her husband is dead but their daughter, Maisie is physically fine. Apparently there were three reasons for the accident. The sun, the sharp turn, and Nick's rapid speed. Clara wonders if Nick would still be alive if she had asked for Mexican instead of Chinese. She is devastated, but also angry. How could Nick have done this to them? Driving so fast down a turn he knew was sharp....with his daughter in the car? His recklessness has left her widowed with two small children to care for. "The bad man is after us. He's going to get us"
When her daughter starts having nightmares about a "bad man", Clara is sure that she knows something about the accident. But Maise won't say anything else. After Maise has a breakdown in a parking lot after seeing a a black car, Clara decides she has to go back and talk to the police. The police aren't receptive and tell Clara they've already investigated and confirmed that it was an accident. But Clara feels there's more to it and starts to do some of her own digging and investigating. Will Clara find what she's looking for? Or is she putting herself in danger? The story is told from Clara's point of view after the accident and Nick's point of view in the months leading up to the accident. I liked hearing both points of view. There was a bit of overlap but not a lot. It gave insight into what was happening with Nick. When Clara learns that her husband had been keeping secrets from her, she starts to doubt everything about her marriage. What else doesn't she know? Is it possible Clara never knew her husband at all? I have to say that Mary Kubica sure knows how to set a scene. She's good at showing what grief, stress, and exhaustion etc. can do to a person. I could almost feel the anxiety and stress Clara was experiencing. When she described how hot it was, I felt like I was starting to sweat and actually turned up my a/c. At the same time, there were a few things that bothered me. I don't want to get into spoiler territory but some of the decisions Clara made as a mother had me baffled. There were contradictions and some of her actions distracted me from the story. I was slightly let down by the ending and felt like a few things were unresolved. However, there are many different opinions about this book, and some of the things that irked me may not bother other readers. Although I was hoping for more, EVERY LAST LIE was still an enjoyable read and I look forward to more from Mary Kubica. Clara Solberg’s world is torn asunder when her husband Nick and four-year-old daughter Maisie are in a car crash from which Maisie walks away unharmed and Nick is injured fatally. Police deem the crash an accident, but when Maisie starts having night terrors and crying about what she saw just before the crash, Clara has reason to believe that her husband’s death was not an accident. In no uncertain terms, I’ Click here to watch a video review of this book on my channel, From Beginning to Bookend. In no uncertain terms, I’m told that this is Nick’s fault. Nick is to blame for his own death. He is the reason why I’ve been left alone with two young kids, a fragmented car and hospital bills. As it turns out, it’s quite expensive to die. Every Last Lie immediately opens with a tragic and gripping setup: Clara just lost the man she loves, is recovering from recently giving birth, now has two small children to raise on her own, has been told by the police that her husband is to blame for her traumatic circumstances; and, before the first chapter concludes, an eerie incident gives readers their first inkling that the crash may not have been an accident. Clara is emotional distraught as she begins to dig for the truth; her mistrust and uncertainty is largely the source of the book’s suspense. Her story is thrilling because questions arise through Kubica’s deft manipulation of Clara’s thought process. She’s a sleep deprived woman grappling with grief and uncertainty, and readers get swept down a vortex of spiraling speculation right alongside her. With sharp writing and clever twists, Every Last Lie succeeds at being a psychologically suspenseful read. Nothing worked; her mind continues to fade. Clara Solberg is experiencing the deep dimension of an unspeakable collision. Her husband, Nick, crashed into a tree with their four year old daughter, Maisie, in the car. He had taken her to ballet class and had picked up Chinese takeout on his way home so that Clara could stay home with their newborn son. But this horrendous collision is now within Clara herself. It's the collision of reality obliterating any sense of the normal life she and her childr Nothing worked; her mind continues to fade. But this horrendous collision is now within Clara herself. It's the collision of reality obliterating any sense of the normal life she and her children once had. Shock does terrible things to one's psyche. It has left Clara reeling in its aftermath. Fortunately, little Maisie was unhurt. Unfortunately, Nick did not survive. But Maisie is now locked into the grasp of reoccurring nightmares involving a black car and a "bad man". Soon Clara suspects that perhaps Nick's fatal accident was no accident after all. She alerts the police, but they dismiss the black car as the ramblings of a four year old. With the support of her father, Clara tries to carry on. Boppy, as Maisie likes to call him, is strained from the care of Clara's mother who suffers from dementia. Clara sees what the weight of this care is doing to him. They both are wounded deeply in different ways and down different avenues. Kubica presents a storyline pumped up with the frenzy of taking on the odds of the impossible. Can anyone really trace the finite details that led to this death? She creates the character of Clara who emulates a woman raging inside from recent death and recent birth. Clara takes this on with the impetus of both wife and mother. Love is the springboard that makes all things possible. Mary Kubica, you have a real winner here. You painted this canvas with life-like characters in life-like situations. It's a bit of a view into what drives and what motivates us to survive in such an uncertain world that can suffocate the best of us at times. Bravo, Ms. Kubica. Every Last Lie is right. So many lies. I am a huge fan of Mary Kubica's writing. It is a slow burn and the suspense creeps up on you with time. While this particular story was a bit slower than my liking, it really picked up about half way through and left me breathless and needing to know which lie precipitated this awful tragedy. And yet, I felt totally let down by the conclusion. There was so much buildup and then it flatlined for me to the point where I feel like I am missing something, some Every Last Lie is right. So many lies. I am a huge fan of Mary Kubica's writing. It is a slow burn and the suspense creeps up on you with time. While this particular story was a bit slower than my liking, it really picked up about half way through and left me breathless and needing to know which lie precipitated this awful tragedy. And yet, I felt totally let down by the conclusion. There was so much buildup and then it flatlined for me to the point where I feel like I am missing something, some hidden message that my brain didn't grasp. These characters definitely ran me through a gamut of emotions - fear, pity, sympathy, disbelief, frustration, and on and on. I loved the dual narrative of Clara (present) and Nick (near past). It really helped to build up the tension and backstory and gave a real sense of suspense. I have to say it would be no easy feat to create a storyline in this fashion, and it's very well done. All in all, the pacing and the conclusion didn't work for me with this one. I will still read each and every one of Mary Kubica's books! When the police leave Clare's house, she knows her life will never be the same. With her four year old daughter in the car, she was told Nick, driving too fast around a dangerous curve, hit a tree. He is dead but thankfully her young daughter is unhurt. She has recently given birth to their second child, a child Nick will not see up. When her daughter begins to have nightmares and day fears about a black car and a bad man, Clare starts to think that maybe there was more to Nick's death than it a When the police leave Clare's house, she knows her life will never be the same. With her four year old daughter in the car, she was told Nick, driving too fast around a dangerous curve, hit a tree. He is dead but thankfully her young daughter is unhurt. She has recently given birth to their second child, a child Nick will not see up. When her daughter begins to have nightmares and day fears about a black car and a bad man, Clare starts to think that maybe there was more to Nick's death than it appears. This book is definitely suspenseful, told in alternating chapters by Clare trying to cope while investigating Nick's death and by Nick, before the accident happens. My problem is that Clare's character irritated the heck out of me. I understand her grasping at straws, following lead after non lead, but the author let this go on far to long, imo. I actually felt more and understood Nick's story and his grasping at straws, his desperation, far more easily. Clare's mothering skills also left much to be desired. So a mixed read for me, suspenseful yes, but maybe a tad overwritten. Please keep in mind other readers did not have the same roadblocks to their enjoyment that I did, always best to read for yourself and see where you fall. A Solid read, which unfortunately yielded very little payoff. Clara Solberg is a mother of newborn Felix, and little four-year old, Maisie. Her husband Nick is their world. Clara and Maisie worship the ground he walks on. That ground however, is not solid under Nick’s feet. He is a dentist in their small town. And unbeknownst to Clara, he is not a profitable one. Yet he pretends to be. Nothing in his life is as it seems. And once that life is taken from him in a car crash, Clara’s world c 3 Stars. Clara Solberg is a mother of newborn Felix, and little four-year old, Maisie. Her husband Nick is their world. Clara and Maisie worship the ground he walks on. That ground however, is not solid under Nick’s feet. He is a dentist in their small town. And unbeknownst to Clara, he is not a profitable one. Yet he pretends to be. Nothing in his life is as it seems. And once that life is taken from him in a car crash, Clara’s world comes crashing down and she discovers the secrets Nick worked so desperately to keep hidden. Clara, however, can’t cope. Not with the secrets. And not with Nick’s death. Her search for answers to both, leads her down a path she can’t quite handle. Her quest affects everything in her life – including her ability to parent her children. This frustrated me to no end. It could have led to disastrous consequences. Luckily for Clara, it did not. “Every Last Lie” by Mary Kubica is a coined as a thriller, but in my opinion, it was anything but. The novel switches timelines between Nick’s - before his demise, to Clara’s – after her husband, Nick’s death. This provides an interesting perspective into each character’s mind, yet doesn’t do enough to make the novel “mysterious.” Clara is a woman whose life was destroyed when Nick died. In her grief and while searching to uncover answers about what happened to her husband, she does completely uncharacteristic things, which frustrated and annoyed me to no end. One could state that all of these choices were simply made out of grief, yet none of these built the stage for a thriller of any kind. That said, all of the characters in this novel, including Clara, Nick, Maisie and Nick’s best friend Connor, etc., were extremely well written. “Every Last Lie” was, in my opinion, a character driven novel centering around Clara and Nick Solberg, not an “exhilarating thriller.” It was however, quick and easy to get through and it kept my attention throughout. Published on Goodreads and Amazon on 7.14.17. 3.75 Stars → I do love Mary Kubica's writing, and in EVERY LAST LIE she presents an engrossing tale of a young mother named Clara facing her husband Nick's secrets and deceit just days after he dies in a car accident. There was one witness to the crash, the couple's 4-year old daughter Maisie, who was strapped in her car seat and luckily unhurt. Clara begins to doubt the wreck was simply an accident when Maisie starts having nightmares about a "bad man" being after them. As she digs for clues, Cl 3.75 Stars → I do love Mary Kubica's writing, and in EVERY LAST LIE she presents an engrossing tale of a young mother named Clara facing her husband Nick's secrets and deceit just days after he dies in a car accident. There was one witness to the crash, the couple's 4-year old daughter Maisie, who was strapped in her car seat and luckily unhurt. Clara begins to doubt the wreck was simply an accident when Maisie starts having nightmares about a "bad man" being after them. As she digs for clues, Clara finds that Nick was hiding some unsettling secrets, but were they enough to get him killed? The story is told in alternating perspectives - Nick, in the weeks leading up to the crash, and Clara, in the weeks after Nick's death. I liked that readers got to hear both POVs, which added to the suspense of what Nick might reveal and what Clara might discover. Not only is Clara dealing with her husband's suspicious death, she's also now the sole caregiver of Maisie and newborn Felix. So many anxiety-inducing elements in this story! Clara made some very questionable choices throughout, and I'm sure teetering on the edge of sanity didn't help. I guess I have two niggling complaints with the book. First, there were some loose ends and questions that I wanted answers to, and secondly, I wasn't thrilled with the ending. I read another mystery that had a similar ending, and while it worked there, it didn't so much with EVERY LITTLE LIE. Nevertheless, I still think this was an intriguing and well-written book, as much a character study in grief as a novel of suspense. I was really glad to leave Clara Solberg behind me. I simply didn't like her. I felt sorry for her situation but she was just so self absorbed that it was hard to feel real empathy for her. In her late 20's and nursing a brand new baby days old, a knock comes to her door. Her husband, Nick, has been killed in a car wreck but her four year old daughter, Maisie, in the backseat comes through unscathed. Her daughter's safety barely registers with her but grief is a strange thing. Then she does some I was really glad to leave Clara Solberg behind me. I simply didn't like her. I felt sorry for her situation but she was just so self absorbed that it was hard to feel real empathy for her. In her late 20's and nursing a brand new baby days old, a knock comes to her door. Her husband, Nick, has been killed in a car wreck but her four year old daughter, Maisie, in the backseat comes through unscathed. Her daughter's safety barely registers with her but grief is a strange thing. Then she does some really odd things. Even though her daughter was in the car wreck, Clara refuses to tell Maisie that her father is dead. Maisie is understandably confused. She starts to have nightmares and talks about a bad man. Clara jumps to the conclusion that Nick was murdered. Someone ran him off the road. So off she goes with a new born son and a traumatized 4 year old to discover the murderer. There are other story lines. Her mother suffers dementia and her father tends her. There is a caretaker and a situation that arises that is so predictable that I yawned when I first read it. The story is told from Clara's perspective now and Nick's story leading up to the fatal crash. It turns out that Nick is not all he seems to be (who could have seen that coming? Everybody). Lots of bad things are going on his life but Clara notices none of them. Did I mention she was self absorbed so she had no clue of anything. Really? I have been looking forward to reading this novel for sometime now and have had high hopes for it, so on reading it I am so pleased to be writing positive things rather than saying how disappointed I was. The latest novel by author Mary Kubica is an excellent read and succeeded in keeping me up trying to finish it in an effort to discover the truth. Clara Solberg's perfect life collapses the day her husband, Nick, and her daughter, Maisie are involved in a car crash. Nick is killed but fortunately I have been looking forward to reading this novel for sometime now and have had high hopes for it, so on reading it I am so pleased to be writing positive things rather than saying how disappointed I was. Clara Solberg's perfect life collapses the day her husband, Nick, and her daughter, Maisie are involved in a car crash. Nick is killed but fortunately Maisie survives. The Police are certain that the crash is an accident, caused by Nick speeding and apparently losing control and crashing into a tree. But when Maisie starts to have nightmares and when she mentions that there was another car involved Clara starts to think that maybe her husband was murdered. Clara is troubled and needs answers, she refuses to tell her daughter that Nick is dead and struggles to eat and sleep. Clara discovers that Nick had secrets and there are plenty of unanswered questions. She discovers that they were in a lot of debt and that Nick was gambling. Lots of unanswered questions that throw her suspicions on several people as she tries to uncover the truth behind her husbands death. The story is told in part by Clara, the here and now and Nick's tells his story in the months leading up to his death. This book is full of suspense and is a real page turner. A well written novel that is a real who-dunnit and had me guessing right to the end. I would highly recommend this novel to readers who love suspense. Clare Solberg is home with her new four day old baby when the police knock on her door to tell her that her husband Nick has died in a car accident. They tell her he was speeding and with the sun in his eyes, took a bend too fast, ran off the road and hit a tree. Fortunately, their little girl Maisie survived with barely a scratch. Now Clare must face life as a single Mum with two young children. Struggling with her grief and sleep deprived looking after a new born, Clare has trouble accepting th Clare Solberg is home with her new four day old baby when the police knock on her door to tell her that her husband Nick has died in a car accident. They tell her he was speeding and with the sun in his eyes, took a bend too fast, ran off the road and hit a tree. Fortunately, their little girl Maisie survived with barely a scratch. Now Clare must face life as a single Mum with two young children. Struggling with her grief and sleep deprived looking after a new born, Clare has trouble accepting that Nick's accident was his own fault. When Maisie starts having nightmares and talking about the bad man in a black car coming after her and her Daddy, Clare starts to believe that Nick might have been murdered. Nick? My Nick? It can't be. Nick wouldn't hurt a fly or tell a lie... EVER. Did Clara really know her Nick? Nick's life kept spinning and spiraling out of control as debts mounted and his savings was depleted, and then the unthinkable happened. Clara couldn't believe her husband was talking on the phone while driving, driving too fast around a curve when he had their daughter in the car, and having an affair. When the police came to Clara's door and said there had been an accident, Clara didn't want to believe it was Nick until she saw him lifeless on the table in the emergency room . The only saving grace was that Maisie miraculously hadn't been harmed. As the days after Nick's death turned into weeks and Clara still hadn't told her daughter her father had died, Maisie began to scream about a bad man and continually asked when her daddy would be home. This made a sleep-deprived and grieving Clara believe someone had killed Nick and that it wasn’t his speeding that had killed him. EVERY LAST LIE begins with a car crash that turned Clara's life upside down for more than one reason and turns worse every day as things about her husband are revealed. Nick lied about their finances and who knows what else. Clara just couldn't believe it. Clara was an annoying character for me because she had no clue about what was going on in her household, and her parenting skills were awful. She left children in a running car and didn't know how to handle crying children. She didn't even know how to take care of herself. Nick seemed to be a good father and husband on the surface but a sleaze bag in every other way. There actually were not too many trustworthy characters in this book, but oh did they all make EVERY LAST LIE an excellent read. Ms. Kubica cleverly moves from past to present with chapters headed CLARA and chapters headed NICK - BEFORE And AFTER as she takes us on a secret-revealing ride with the secrets having been better left unknown. This was my first book by Mary Kubica, and it grabbed me the minute I read the suspenseful, attention-grabbing opening lines. EVERY LAST LIE is a book every reader of psychological thrillers won't want to miss. Clara Solberg has a perfect life .... at least up until the day her husband, Nick, and her daughter, Maisie are in a car crash. Nick is killed, Maisie, fortunately, got nothing but a scratch. The accident is ruled an accident ... Nick had been speeding and apparently lost control and rammed into a tree. However, Maisie is having night terrors, leaving Clara to think that maybe her husband was murdered. Clara has to find out the truth. She can't sleep, she doesn't eat. She hasn't even told Maisie y Clara Solberg has a perfect life .... at least up until the day her husband, Nick, and her daughter, Maisie are in a car crash. Nick is killed, Maisie, fortunately, got nothing but a scratch. Clara has to find out the truth. She can't sleep, she doesn't eat. She hasn't even told Maisie yet that her daddy is gone. Her grief is overwhelming and she's obsessed with the idea that her beloved husband was murdered. Her pursuit of truth leads her to secrets that her husband kept from her. She didn't know how much in debt they were. She doesn't know that he had begun gambling. She doesn't know that Nick fired his best friend? What else is there that she doesn't know? The story is told in part by Clara, the here and now. Nick's story is told in his voice in the months leading up to his death. This is another highly suspenseful story by this author. The story premise is cleverly written and the characters are solid. The ending was quite different from what I thought it would be. The only thing I really didn't like is that there seems to be no separation (as in chapters) between Clara's story and Nick's remembrances. They ran into each other. I would be reading Clara and then all of a sudden it would hit me that I was reading Nick. Just a tad disorienting. Many thanks to the author / Harlequin (US & Canada) / Park Row Books / Netgalley for the advanced copy of EVERY LAST LIE. Opinions expressed here are unbiased and entirely my own. One of my very favorite authors, talented Mary Kubica returns following, the sensational Don’t You Cry, landing on my Top 10 Books of 2016 with yet another 5 star winner: EVERY LAST LIE — a compelling and clever domestic suspense of a young widow trying to make sense of her husband’s untimely death. A slow-burning twisty psychological suspense. Heart-pounding, a tale of one woman's desperate search for answers. From an array of emotions —grief, disbelief, anger, fear, and confusion. What was her husband hiding? Her children are one parent away from being orphaned. A young daughter with nightmares. Was he killed purposefully, intentionally and with malice? Was he the bad man or someone else? Clara Solberg lives in Chicago suburbs with her husband Nick, a dentist; with children: four-year-old daughter, Maisie, and newborn son, Felix. A few days after Felix is born, Clara receives the horrific news. Her husband is dead in an automobile accident, yet their daughter is alive, unharmed. He was on his way home from taking his daughter to ballet practice. Chinese or Mexican? These are the last words Clara would ever exchange with her husband. If she had asked for Mexican, Nick would be home. A crash on Harvey Road leaves one dead. An accident implies that something has happened unintentionally and without deliberate cause. Soon Clara begins to suspect foul play was to blame. She is angry at Nick for leaving her. Nick is dead. When she is not sad, she is angry. For him being careless. For driving too fast with Maisie in the car. For driving too fast period. For losing control and launching headfirst into a tree. She hates the tree. The force of the impact wrapped the car around the oak tree on Harvey Road, while Maisie sat in the back seat, on the opposite side, miraculously unharmed. Reckless driving is to blame. There is no investigation. Driving too fast? What was going through his mind, minutes before the accident? Her daughter says there was a bad man in a car, following Maisie and Nick. Who is the bad man that was following Nick and her daughter? Who is the bad man that took her husband? A black car. Her daughter is afraid. She continues to scream, “the bad man is after us. He’s going to get us.” She fears for her terrorized four-year-old-daughter. She fears for herself and her family. She replays Maisie’s words over and over in her mind. In no uncertain terms, Maisie has made it clear that Nick’s car accident was no accident at all. The questions continue to run through her mind. Does Maisie know this evil man? Did the car push Nick from the road? Did her daughter get a glimpse of him before the car went airborne, flying into the tree? Did Nick see the man? An illusion or a figment of a little girl’s imagination? What if there was another car on the road that fateful afternoon? What didn’t she know about her husband? What secrets was he hiding? Everyone loved Nick. He had no enemies. Whatever transpired on the street had to be the worst kind of luck, a simple act of being at the wrong place at the wrong time. Was someone watching Nick as he crashed? Why was he going sixty on four-five miles per hour road, that drops to twenty at the bend? How could Maisie be fine and unharmed? Did he take the turn too quickly? A black car? Would he take his own life with his daughter in the car? Carla is in denial. She cannot bring herself to tell her daughter her father is gone and not coming back. He is dead. She must find answers. Financial problems. Who was Melinda Grey? Drugs, restraining orders, stealing, affairs, suicide? Not Nick. There were no secrets in their marriage, or was she wrong? She begins to suspect everyone. Nick’s secrets. How secrets can destroy marriages. Lives. Families. From an unreliable narrator, feelings of paranoia, grief, confusion. The money. She soon learns there is nothing. She needs closure. She hates this sense of the unknown and uncertainty. What really happened on Harvey Road? Clara is overwhelmed by grief, caring for her children, the needs of her aging parents; she’s also unable to sleep. She is coming unhinged. Is she going through the stages of grief? Can she ever reach acceptance? Skillfully executed, Kubica takes readers on a chilling psychological journey— a woman grief-stricken obsessed with solving the events surrounding her husband’s mysterious death. A fan of Mary’s very first book and everyone in between, to her latest: EVERY LAST LIE – a domestic suspense which will leave you guessing to the conclusion, as we hear from POVs of Clara and Nick. Motherhood is a strong ongoing theme in this whodunit mystery novel. Both Clara as a mother to Maisie and Felix, as well as Clara’s relationship with her mother, Louisa. Relationships strained. An ideal choice for book clubs and further discussions. As always each of her books is strongly character-driven and psychologically rich. You feel Clara and Nick’s desperation. If only there were no lies. How would the outcome be different? The feeling of entrapment and coming unhinged is front and center. A twisty suspense of lies and secrets you cannot miss. For fans of B.A. Paris, Ruth Ware, Kimberly Belle, Clare Mackintosh and Fiona Barton My favorites. Highly recommend all Mary Kubica’s books! Top-rated —she never disappoints her fans, and you can always expect to be surprised. A special thank you to Park Row Books and NetGalley for an early reading copy. Also purchased the audiobook narrated by Carly Robins and Graham Hamilton for an engaging performance. Clara has just given birth to her second child when her husband Nick dies in an accident. (This is not a spoiler, it's how the book opens.) Their daughter Maisie has nightmares and terrors that leads Clara to suspect Nick's death was not an accident. Told in alternating chapters with the POV of both Clara and Nick (before the accident) the pieces of the puzzle that led up to the accident are revealed. Clara's suspicions leads her to conduct an investigation of sorts, all while she's navigating new parenthood, financial problems, grief, and her mother's worsening dementia. Clara is overwhelmed with grief and obsessed with finding the truth, and finds plausible reasons and evidence for a number of different scenarios. There's a feverish quality to her narrative and I felt her pain, confusion, and grief. Painful secrets her husband kept from her are uncovered and she begins to suspect different people with each revelation. The characters, including Nick, aren't always the most likable people. I found this a credible narrative of grief, as well as those crazed sleepless first days/weeks with a newborn and the exhaustion that comes with it. The suspense was more of a slow burn since Nick was already dead, but along with Clara I wasn't sure who or what was responsible for the accident and was invested in discovering the truth. This wasn't my favorite book of hers but it was a solid read for fans of the author. This review has been hidden because it contains spoilers. To view it, click here. Wow, what a disappointment. All that buildup and in the end, this is just a story about a guy who bought a necklace for his wife and then died driving too fast. Literally, that's it. Mary Kubica is one of the better suspense writers in publishing. Her latest book does not disappoint. When Clara's husband Nick dies in a car crash just days after the birth of their son, Clara works to put back the pieces of her life and discover what really happened on the road that fateful day. Kubica gives readers plenty of red herrings and lots of questions to keep us on our toes. The writing is tight and pages nearly turn themselves in this fast-paced thriller. Every time my family gets sick, my mind goes on a wild goose chase trying to pinpoint where we could have picked up the offending germ. It's ridiculous and pointless, I know, but it helps me somehow with the stress and inconvenience of it all. So I understood completely when Every Last Lie's unfortunate new widow needed an explanation for every single infraction that surfaced after the death of her husband. There are small lies, blatant omissions of truth, and substantial what the f*ck's. Mary Kubica allows alternating perspectives and timeframes to tell this story. Clara, the widow, starts readers off beginning the day she learns of her husband's death via car crash and continues as she sifts through the mystery that has become his life. Their four-year-old daughter, who was in the vehicle at the time of the crash, provides clues along the way, creating an even more disjointed but intriguing trail to follow. Within his individual perspective, Nick, the husband shares all his secrets beginning months prior and ending right up to the crash. This creates tons of suspicion and that thriller element that makes this genre so fun to read. As with most books in this genre, there are a lot of questions and not a lot of answers which spikes the suspense and allows readers to entertain themselves by drawing several premature conclusions. The characters are developed well which allows strong issues to shine, such as motherhood, grief, aging parents, and fighting battles alone. Based on my personal reading experience though, Clara's POV felt repetitive and slow as she spins round and round in a never ending circle of confusion. I much preferred Nick's POV as it allowed the mystery to take on a more visible shape, enabling the reader to start their own guessing game as to what happened and who was involved. In the end, I had predicted the outcome several times and was personally disappointed that I was right. However, Ms. Kubica wrote a twist I have never read before so well done! in that regard. Overall, the combination of slow pacing and a build-up that (in my opinion) overshadows the conclusion ended up creating a reading experience that I don't feel enthusiastic about. However, if you have historically enjoyed Mary Kubica's work, check out this title for yourself and see what you think! Thank you to the following for permitting me access to an advance reader's copy (ARC) of Every Last Lie. This generosity did not impact my honesty when rating/reviewing. Clara’s husband, Nick, is killed in a car accident that leaves their young daughter, Maisie, remarkably unscathed. However, Maisie begins to suffer from night terrors, crying out about a “bad man” and asking “Daddy” to “save them” from the “bad man”. As Clara tries her best to soothe her daughter, she begins to wonder if it really was an accident that killed her husband and if not, who could be possibly want her husband dead? Another spot-on, suspense-fueled, gripping psychological thriller fro Clara’s husband, Nick, is killed in a car accident that leaves their young daughter, Maisie, remarkably unscathed. However, Maisie begins to suffer from night terrors, crying out about a “bad man” and asking “Daddy” to “save them” from the “bad man”. As Clara tries her best to soothe her daughter, she begins to wonder if it really was an accident that killed her husband and if not, who could be possibly want her husband dead? 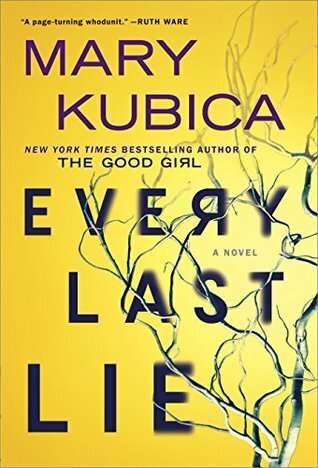 Another spot-on, suspense-fueled, gripping psychological thriller from the wonderful Mary Kubica, “Every Last Lie” is fast-paced and filled with drama and intrigue. Each page-turning chapter is as addictive as the one before it, making this book impossible to put down. A huge fan of Kubica, this novel kept up the pace of her other works. Written creatively, with well-thought-out storylines and developed characters, Kubica draws a reader in from the start. Clara is honest and real, and a reader is easily able to connect with her and sympathize with her as she struggles with her grief and possible deception from the one man she loved most. There are several possible ways this novel could have turned out, many twists and turns that could’ve resulted in any one of the many people being the “killer” of Nick. Each time I hazard a guess, Kubica would throw in another surprise and get me off my trail. When the ending finally came around (nice and succinctly, as with her other novels), it was extremely satisfying and comforting- wrapping up a great novel in the perfect way. High-fives all around for Kubica. Her latest work, “Every Last Lie” is gripping, stunning and absolutely un-put-down-able. Highly recommended, Ms. Kubica is certainly one to watch in the psychological thriller genre. She has not yet let me down and I look forward to her next work! Nick and Clara Solberg seem to be a happily married, successful young couple living on the outskirts of Chicago.....until something terrible happens. Nick is driving his little girl home from ballet class when a terrible accident takes his life.....and miraculously spares his four-year-old daughter Maisie. Nick's wife Clara - who's home nursing their 4-day-old infant Felix when the tragedy occurs - is shocked and disoriented by the loss. One minute she's married to a successful dentist, and the next she's a 28-year-old widow with two small children. Clara has other problems as well. Her mother is suffering from Alzheimer's disease and her father - who cares for his wife with the help of an aide - can barely cope. The police investigate the crash and conclude that Nick's reckless driving caused the accident. Clara refuses to accept this; she doesn't think Nick would put his child at risk. Clara's beliefs are reinforced when Maisie says 'a bad man' was following the car.....and freaks out at the sight of a black automobile. Clara concludes that someone in a black car forced Nick off the road - in other words, murdered him! Clara does some investigating of her own, and talks to people who live near the accident site. She brings her 'evidence' to the police, who say they'll look into 'the black car' murder theory. However, the cops are clearly skeptical. Meanwhile, Clara - a photographer with little income at the moment - knows she has to pull things together. She needs to collect Nick's life insurance to pay for hefty funeral expenses and household bills; and she has to sell Nick's dental practice. When Clara looks into doing these things, however, she discovers that Nick was keeping BIG secrets from her! The story is told in the alternating voices of Nick and Clara. Nick relates his experiences before the accident; and Clara talks about what happens right before and then after the crash. In Nick's narrative we learn that he had a big fight with his bullying neighbor across the street; he pulled the tooth of a patient from hell, with dire consequences; he fell out with his 'partner' in the dental practice; he gambled with the family's funds; he became reacquainted with his (now married) former girlfriend, whose son might be his; and so on. Nick was becoming undone by these problems - but felt he couldn't tell Clara because she was pregnant. In Clara's chapters, we see her find out about Nick's secrets.....one by one. Clara discovers that the dental practice is in disarray and that Nick's life insurance policy was cancelled. Clara also sees a receipt for a pricey necklace among Nick's things and learns that a woman had a restraining order against him. These discoveries - and other 'clues' - lead Clara to speculate that Nick was having an affair; that he was a drug dealer; that he was planning to leave her; etc. Clara adds to her own troubles by refusing to tell Maisie that her father is dead. Maisie's continual request 'to see daddy' is met with lies and misdirection. On top of all that, Clara's parents are in crisis. Her mother no longer recognizes her; acts out when Clara's visits; and - when no one is looking - swipes the car keys and goes for rides. For his part, Clara's father seems to be having problems with his memory and is apparently mishandling the family's finances. The story is engaging and kept my attention, but at some point - around the middle of the book - the characters' woes started to strain credulity. For instance, Nick's problems became so immense that I no longer believed he could keep them from his wife. A man with so much on his mind couldn't act act completely normal at home. Surely Clara would suss something out! As for Clara, she seemed to lose all her common sense and - at one point - behaved like a psychopath.....with her children right there. I found this behavior to be unbelievable. Even with these problems, though, the story is a compelling thriller with surprises I never saw coming. The book doesn't require much deep thinking and would be a good choice for vacation entertainment (IMO). Will this book never end -aargh!! First - an L shaped (90 degree angle) does not a hairpin turn make. She tries too hard to be descriptive - repeatedly. Though Clara suffers a shattering loss, she is too helpless and unlikeable to garner much sympathy from this reader. And the book does nothing to promote female intelligence. Not only is Clara a poor parent, she is a stupid woman. And lazy. How difficult is it to let a dog pee outside rather than in the corner of a house. Yuck!! And how can one no Will this book never end -aargh!! And how can one not like a child? I never once liked bratty. Maisie who watches non-stop TV. And Felix. And their names... Boppy is even annoying!! And Clarabelle - give me a break! Nick loved her - sad that she even questions it. Boring!!! Those things said, it is a tale that I did finish, but barely. Save yourself the trouble. Since the release of the blockbuster debut novel The Good Girl, Mary Kubica has carved out a successful career in the suspense and psychological thriller field. Every Last Lie is Mary Kubica’s latest explosive read. It focuses on the fallout from a tragic accident that claims the life of Nick Solberg, a young dentist, a loving husband and a doting father of two children. Every Last Lie is a compelling read that outlines one young widow’s determination to never give up and find out the root cause to her husband’s shock passing. Clara Solberg is a mum of two, who gave birth to her son Felix only a matter of days before her husband and daughter have a horrific car crash. This car crash is fatal, leaving Nick brain dead and soon after the accident, he passes away. Maisie, the couple’s daughter, miraculously survives the crash relatively unscathed. The official police ruling on the car crash deems it as an accident, Nick’s death is blamed on reckless driving. In the days that follow, Clara cannot shake the feeling that Nick would not drive so carelessly with their daughter Maisie in the car. Coupled with Maisie’s nightmares since the accident, Clara is beginning to wonder if her husband’s death was simply an accident or it was deliberate. Clara cannot push this gut feeling pertaining to Nick’s cause of death aside and resolves to do all she can to get to the truth. It is a desperate hunt for answers that is plagued by Clara’s personal struggles with being thrust into single parenthood, fighting insomnia, worrying about the care of her mother with dementia and dealing with the family business finances. In the months leading up to Nick’s death, Clara discovers a trail of deceit that makes her question if she really knew the real Nick. Mary Kubica has made a name for herself in recent years, delivering one successful psychological thriller release after another. Every Last Lie is her latest intoxicating thriller that follows a sleep deprived widow’s attempts to hunt down the final cause for her husband’s untimely death. This quest takes widow Clara to the dark recesses of the mind, questioning all that she holds dear. Kubica is a clever novelist, who is able to twist the reader around her finger, by hooking the audience in from the starting line of her latest novel. I was instantly sucked into Every Last Lie and this fixation with the story at hand didn’t let go until the final page was turned. For me, I firmly believe it indicates Kubica’s skill as an accomplished writer in the thriller genre. Kubica’s mode of storytelling is absorbing. In Every Last Lie, the narrative is told via a rotation style format. The reader is kept up to date with events in the present time, told by Clara, now a widow. The other point of view is husband Nick’s perspective, which covers the developments in the past, focussing on the months leading up to Nick’s accident. This is an ingenious form of narrative building, as the suspense is delivered at a steady rate, evenly feeding the reader clues as to the central mystery. Kubica applies a strong sense of realism to her characters. Clara was a character that I was very quickly able to relate to. I have experienced the pangs of new motherhood and the lack of sleep that goes hand in hand with a newborn. Coupling this with the care of older children and the household in general is hard indeed. What broke my heart was how this poor young woman, recovering from childbirth and dealing with a newborn, was thrust into widowhood through such a tragic occurrence. It made me shudder at the very thought of how I would have coped in such a scenario. It was simply unfathomable! Clara seems to have too much to contend with in Every Last Lie, from becoming an unexpected widow, dealing with a newborn, coping with a preschooler experiencing night tremors and the added pressure of her mother’s dementia. I was surprised Clara didn’t suffer a full breakdown! With so much on her plate, the reader is left in doubt as to Clara’s credibility and ability to deal with the truth. Either way, Clara earned both my pity and my deepest sympathy. Nick is also a character dusted with a strong coating of realism. With half of the narrative told from his viewpoint, it is easy to develop an attachment to Nick and understand how complicated his life became in the time leading up to his death. The secondary cast, such as Clara parents, neighbours, the law enforcement, Nick’s colleagues and patients from his dental practice, Kubica ensures that each character has a duty in the novel. This gives room for suspicion, doubt and possible involvement in Nick’s death to arise from these characters. Kubica largely keeps the reader on their toes, providing many moments of misdirection in the novel, in order manipulate the final outcome of this novel. It was a final outcome which I didn’t see coming. Every Last Lie is a stirring read that made my heart break, while simultaneously keeping my mind boggling, as widow Clara unravelled the layers to expose the truth of her husband’s death. Kubica is dexterous writer, flashing her skills in the thriller genre, to drop a tale into her reader’s hands that meshes the past and the present in one spectacular fallout. I enjoyed the white knuckled ride immensely. *I wish to thank Harlequin Books Australia for providing me with a free copy of this book for review purposes. Clara Solberg's life gets turned upside down when her husband and their four year old daughter, Maisie are in a car crash. Her husband, Nick, had taken Maisie to her ballet practice, picked up Chinese food and was on his way home when his car hit a tree, killing Nick but leaving Maisie unharmed. Clara is not willing to believe that her husband's death is accidental. Her daughter is having nightmares about a bad man being after them. A bad man who may have been following then that tragic night. Cl Clara Solberg's life gets turned upside down when her husband and their four year old daughter, Maisie are in a car crash. Her husband, Nick, had taken Maisie to her ballet practice, picked up Chinese food and was on his way home when his car hit a tree, killing Nick but leaving Maisie unharmed. Clara is not willing to believe that her husband's death is accidental. Her daughter is having nightmares about a bad man being after them. A bad man who may have been following then that tragic night. Clara, who has recently given birth to the couple's second child is sleep deprived and full of grief. She is fueled by the need to know the circumstances surrounding her husband's death. This book is told through both Nick and Clara's point of view/perspectives. Through Clara's POV the reader gets a glimpse on how she is coping with her husband's death and the "truths" she uncovers surrounding her husband, his dental practice, their finances and his relationships with others. Through Nick's perspective, we see a man hiding secrets from his wife. He's not a bad guy. He is a man who wants to protect his wife from feeling stress while she is pregnant, so he is not forthcoming with the truth. Nick plans to come clean - to tell her everything. He just never seems to find the time to sit her her down and tell her everything. He also makes decisions without his wife's knowledge. What will happen when she finds out the truth? How will he dig himself out of the hole he has dug? What happens when your good intentions spiral out of control? What really worked for me was the alternating perspectives of Nick and Clara. This book was a fast easy read which kept my attention the entire time. Kubica kept the plot, secrets and revelations coming at a very good pace. I had to keep reading to find out what lies and what truths would be revealed. As the story progresses, the book turns into a page turner as the truth finally comes out. Clara and the reader eventually learn the truth about Nick's accident. This is a good book for those who enjoy a good mystery/thriller without an graphic scenes/language/gore, etc. I received a copy of this book from Harlequin/Park Row books and Netgalley in exchange for an honest review. I guess I’m in the minority here but I did not like this book particularly much! I’ve read all of Kubica’s books (4 I think!) but so far only The Good Girl really impressed me. The others were solid writing and compelling but there’s no better love that the first I guess. In my country we have a saying: ‘E a montanha pariu um rato’ something like ‘and the mountain gave birth to a mouse’. Much ado about nothing really! That’s exactly what I thought after finishing ‘Every Last Lie’. ‘’’’’’’BIG SPO I guess I’m in the minority here but I did not like this book particularly much! Yes, it was in fact an accident!!! Really?? Off course I suspected the easy way out was going to be used to explain the big death but really?? Disappointing and rather lackuster ending. In my view Every Last Lie has been my favourite book by the author Mary Kubica. I found that the characters were more believable, as in real-life people often die close to each other, I had two Nan's that died twenty-two days with in each other, just like in this novel. I related to Clara Solberg giving birth with taking the baby home, getting no sleep, making your eyes feel heavy, as I had the same problem getting no sleep with my daughter when she was a baby. I thought that the theme of the story was showing just how exactly one moment a life can be full of roses being a mother and a wife, with the next it can be filled grief. Clara Solberg's life is shattered by grief when her husband dies in a car crash. There is even more torment for Clara when her four-year-old daughter tells her mum that a bad man is after them. Was Clara's husband car accident an accident at all? How well does Clara know her husband and has Nick been keeping secrets from her? Although this story wasn't based on a real place I could picture the where the car crash scene took place. There is a great twist in this page - turning suspense that I didn't see coming. I do think that when a family member dies that it is the most hardest thing to explain death to a young four-year-old. I personally haven't read a book like Every Last Lie so I can't compare it to any other book for you readers. Every last lie would make an excellent book for a reading group to discuss as there are a lot of points about speeding in a car to do you tell the truth when a family member dies or do you keep it a secret from a child. Mary Kubica is the New York Times and USA Today bestselling author of four novels. She holds a Bachelor of Arts degree from Miami University in Oxford, Ohio, in History and American Literature. Mary lives outside of Chicago with her husband and two children.